Bathrooms are usually the most neglected rooms when people do up their homes. Generally so sterile and boring, dull as ditchwater. Luckily there’s a really quick fix for boring bathrooms – pretend it’s another room! I decorate my bathroom as I would my living room, and don’t worry about using “conventional” bathroom furniture. As soon as you get away from that, the more fab and exciting your bathroom will become. Light candles, have a cosy chair to curl up in, decorate with rugs, plants and artwork. You can definitely shop your home for this, so plunder things that would normally belong in other rooms – your dining room, or living room – and bring them into the bathroom to give it a bit of love and TLC! I’ve found some of the most jaw on the floor, fantastical bathrooms out there. Good news is that you can use them as inspiration and learn tricks for how to perk up your own pad! 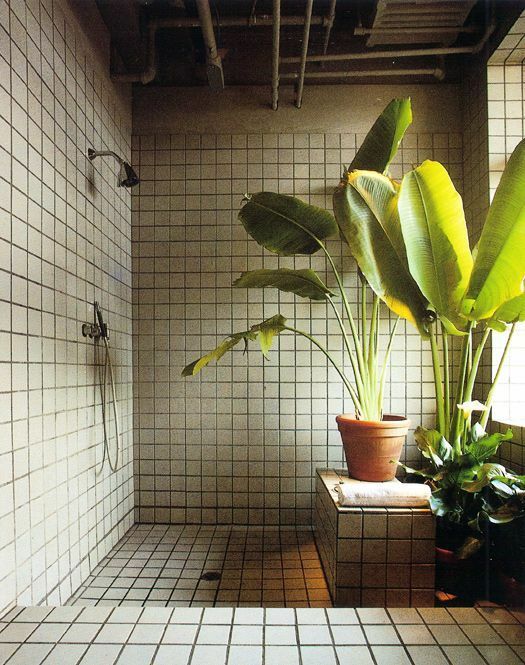 I love the idea of trying to screen off bathroom areas with loads of foliage and leafy greens. The best thing about the fauxs is that they’ll carry on looking gorgeous, even in little windowless bathrooms. I’ve got loads in my downstairs loo, where it’s too dark for any real flowers to survive.